Although the entire basilica contains numerous, impressive works and structures from the Baroque—as well as the Renaissance—the apse in the rear of the Cathedral is perhaps the best representation of the Baroque. Upon approaching the apse, one cannot help but be amazed by the sheer size of the space—and the entire building, for that matter. The high, domed ceiling is ornately decorated with painted stucco depictions of Christ, several saints, and numerous other heavenly hosts. Gilt trim borders each image and creates an awe-inspiring grandeur throughout the entire space. The use of grandiose designs and decorations is common throughout Baroque architecture; it facilitates the desired overwhelming effect felt by the viewer. 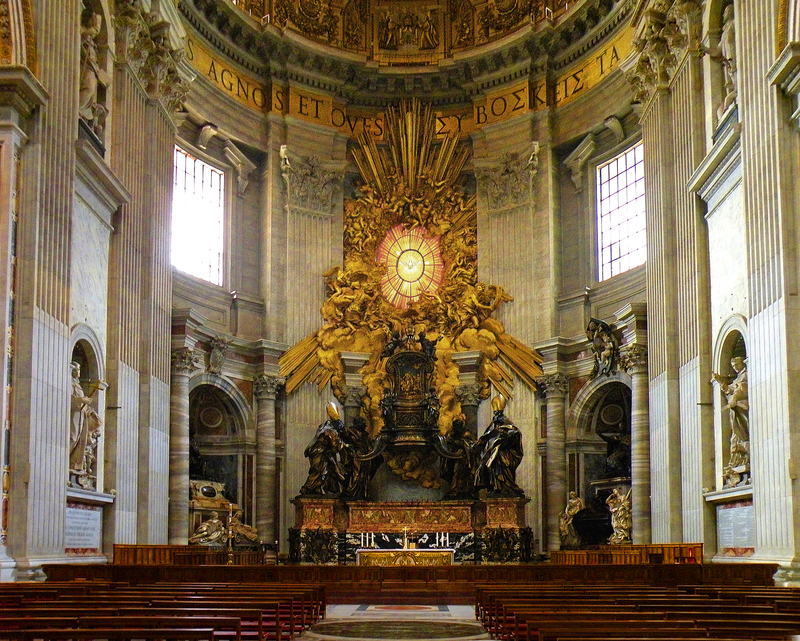 Numerous sculptures of saints are tucked into alcoves on either side of the main altar, but the primary piece in the room—and the one created by Bernini himself—is the Chair of St. Peter. 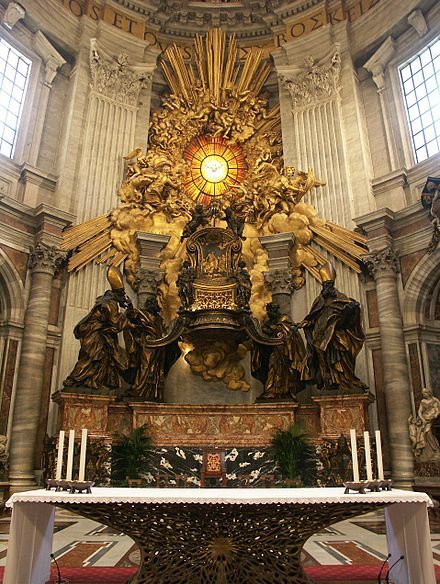 This massive, bronze monument to the Church’s founder is not simply the altarpiece for the apse, but it is also an extravagant encasement of an important relic: a chair that many believed to have been used by St. Peter. The original chair, in a state of disrepair during Bernini’s time, is enclosed within this bronze throne. 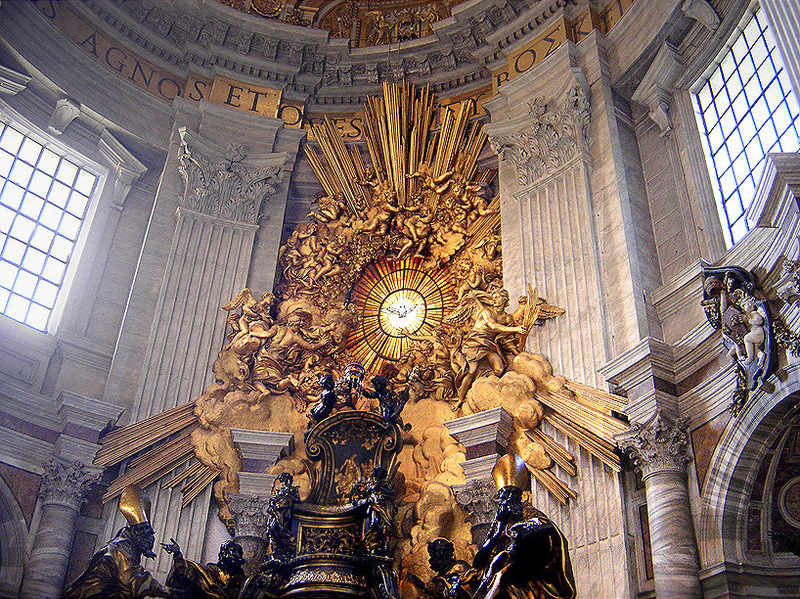 The chair is backed by a gilded depiction of St. Peter receiving the keys to the church from Jesus. Behind and above the chair is a host of gilded cherubs and angels, as well as sculpted clouds and rays of light that are emanating from a central pane of stained glass window. In this pane is a dove holding an olive branch, a common representation of the Holy Spirit in the Christian tradition. With exterior light illuminating the pane, as well as the general glow of the gilded bronze, the entire sculpture radiates a heavenly aura, which is surely meant to enrapture and inspire the viewer. The Chair is supported by sculptures of the Four Doctors of the Church: St. Augustine, St. Ambrose, St. Chrysostom, and St. Athanasius, all of whom were major reformers.8 These dynamic portrayals, which are detailed and life-like, give an otherwise stationary object—a throne—a sense of movement. Combined with the rays of sunlight that are bursting forth from behind the throne, this dynamism—a defining a feature of the Baroque6—creates the feeling that this enormous structure is somehow moving toward the viewer. This piece was meant to elicit emotion and to be a full experience for the audience; the entire structure carries with it the “dramatic theatricality”6 that Bernini strived for in his architectural works. The four figures supporting the throne also serve as rhetorical figures, or guides, for the Christian viewer; Christians are meant to support the Church, and perhaps reform it when necessary. This can be seen as a subtle reference to the Counter-Reformation participants of the time. 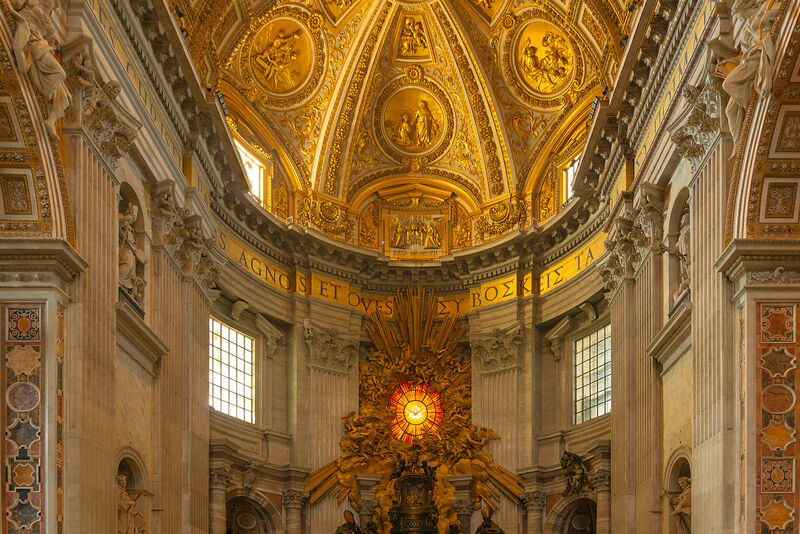 With the combination of the lighting, the painted stucco ceiling, the architecture of the room, and the way the sculpture seems to have become a part of that architecture, the apse in St. Peter’s Basilica is a fantastic example of a Baroque composto; it blends different art media into an awe-inspiring and coherent piece. The grandiosity created by the composto, and the dynamic nature of the Chair of St. Peter, generates a moving and dramatic experience for the viewer. This in turn conveys the Church’s Counter-Reformation message of personal encounters with God.